Legendary Houston political insider James Baker remembered his long-time friend George H.W. Bush as one of the nation's best presidents during a eulogy on Thursday. Former Secretary of State James Baker called former President George H.W. 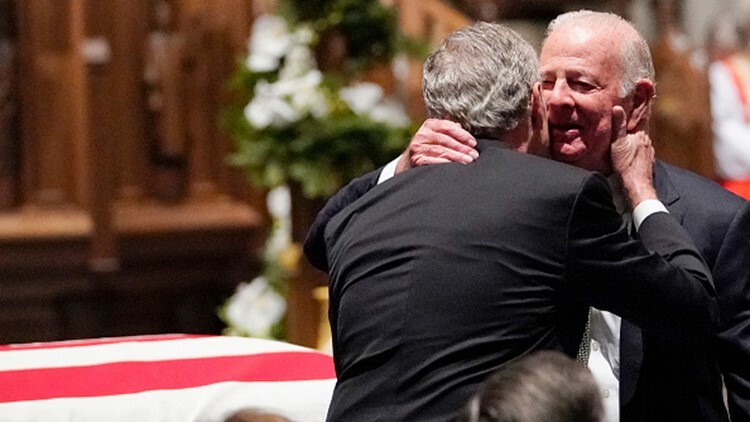 Bush the "best one-term president" in the nation's history as he praised his friend during a eulogy at St. Martin's Episcopal Church in Houston Thursday morning. Bush had the "courage of a warrior but the greater courage of a peacemaker," Baker said during the funeral. Baker used the fall of the Berlin Wall as an example, noting that Bush understood humility toward a fallen adversary. Though he was not a skilled speaker, Baker called Bush's deeds "quite eloquent." Even after he left the White House, Bush continued to display compassion toward others, Baker said. Baker said Bush described their relationship as "big brother and little brother." He was always able to speak his mind to the former president, who, in turn, had an effective way of telling him when the discussion was over. "Baker, if you're so smart, why am I president and you are not?" Bush, according to Baker, would say. Baker's eulogy was given during a private funeral for the family and invited guests. Following his funeral, Bush will travel to Spring, where ‘Locomotive 4141,’ a specialized Union Pacific train donning the colors of Air Force One, will carry the President to College Station and to his final resting place alongside Barbara Bush, his wife of 73 years who passed in April, and Robin Bush, his 3-year-old daughter who died of leukemia in 1953.